Samsung, South Korean electronics giant is preparing a mobile WiMAX that named Galaxy S Pro. The presence of Samsung WiMax Galaxy Pro S has been discussed by the citizens crowded cyberspace. While viewing any product Galaxy Pro S has graced the forums online. Of these leaks, Samsung WiMax Galaxy S Pro uses a slide-out qwerty keyboards. Design a strong body and wrapped with a black color. Samsung WiMax Galaxy S Pro brain uses the ARM Cortex processor 1 GHz. Another feature that is a 5 megapixel camera on the back with 1x optical zoom and 720 p for the record. While the VGA camera is available at the front of the phone. "Super Screen AMOLED (Active-Matrix Organic Light-Emitting Dlode) is very interesting. The black color makes it dark and slick looks similar to the Nexus One. In addition, when looking at white text on a black background would be very easy to see," explained Phil Nickinson of Android Central. Quoted from TG Daily, with a resolution of 480x800, the screen size is rather small compared to HTC's Evo 4G but larger than the Nexus One. Fortunately, 4-inch screen is very responsive to touch. 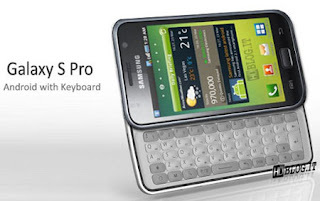 Nickinson revealed that Samsung Galaxy S Pro is currently using the Android operating system 2.1. But he could not confirm whether this phone will use an alias Froyo Android 2.2. "Looks like 3.0 TouchWiz user interface used on Samsung WiMax S Galaxy Pro operation. Let's wait a moment presence," said Nickinson.